It's important to do proper research before investing in a stroller to see if it fits your needs. There are plenty of strollers out there in the market and it can be quite overwhelming for a new mom but having tried a few strollers since Kylie's time, I thought I'd just share my thoughts on what I look for when purchasing a stroller! 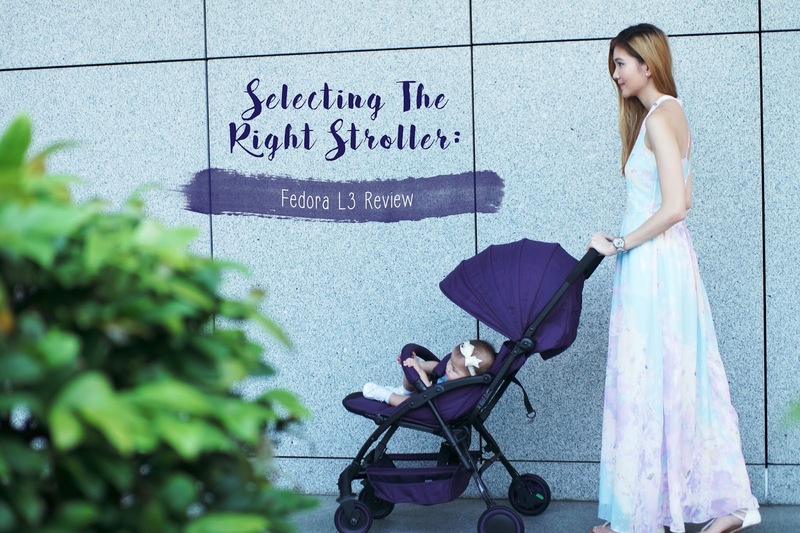 This post comes at a great time since I also got to review the Fedora L3 Stroller from My Miracle Baby! It's easy to tell if a stroller is comfortable for your child just by looking at it. Much like choosing a couch! You can simply tell if it looks comfy or not with just one glance! Or you can bring your baby to test it out to see if he/she likes seating in it, just like cheery Megan below! When choosing a stroller, I always look for one that is well padded with cushions made out of soft fabric. There are some strollers out in the market which are very light-weight but are made with really thin PVC material or a scratchy mesh sort & have zero padding. Those kinds are great as a travel stroller but if you're looking for something to use frequently, then I'd suggest getting one that is comfortable for your child to use long-term. The Fedora L3 stroller isn't just well-cushioned for Megan's comfort, it also has an adjustable leg rest as seen above. The leg rest can be adjusted to two different positions, up (as shown above) or lowered down at an angle to suit your baby's posture! Another thing I look out for when it comes to my baby's comfort, is whether the seat is reclinable or not and to what extent. Most lightweight strollers I know do not have an option to recline the seat or it only reclines a little which makes it really uncomfortable for baby when he/she sleeps. Imagine having to sleep in an upright position the entire time you're out! One thing that I really love about the Fedora L3 is that you can adjust the seat to any angle you want by simply releasing the locking mechanism with a squeeze and pulling on the strap behind the seat to adjust it to your desired height! This means you can adjust it freely at any angle you deem fit from an upright seating to a lying down position to anything in-between! No more having to fuss over a "too upright" or "too low-lying" position! Because Singapore's weather is crazily erratic, I find having a stroller with a canopy to shade my tot extremely important! There have been times when I'm out with my baby and it starts to drizzle or if she's asleep but the sun's just blazing and shining in her eyes so having a stroller with an attached canopy really comes in handy! All I have to do is just extend the shade over her! The Fedora L3 stroller has a canopy that can also be adjusted at different lengths so it's really great to use in a light drizzle or shine! It can also be unzipped at the back to open up for ventilation! Another important factor I look out for is the suitable age range that the stroller can accommodate. I usually like to make the most out of my buck and find one that's suitable from newborn to 3 or 4 years old and the Fedora L3 fits my expectations perfectly! The L3 can be used right from the newborn stage up until 48 months old! Note: Not all strollers are suitable for newborn babies so be sure to check before you purchase! Another crucial factor is of course, safety. As a mom, I'd certainly want to feel assured that whatever I put my baby in is safe - meaning, the seat buckles are child-proof and secure enough. Most strollers in the market comes with only a waist seat belt and I've found this to be quite dangerous at times because as your child grows, he/she will want to climb out of the stroller and it's very easy for them to just slip their legs out. The Fedora L3 on the other hand, is equipped with a 5-point safety harness that secures baby in from the torso down as you can see from the pictures above! I travel using public transport and a lot of times I do so alone so having a stroller that is light and compact for me to lug around while carrying a baby and a diaper bag full of baby stuff really matters to me. My previous stroller was really heavy and bulky so much so that it caused a huge inconvenience for me especially when boarding and alighting buses! But with the Fedora L3, it's very compact and even comes with a shoulder belt for me to just sling on and go! & as you can see, it's perfect even for manoeuvring through tight and narrow spaces! The first stroller I had was a chore to operate and I always struggled with opening or closing the pram when I'm on my own with a baby in the other hand. So one major thing I've learnt is to find a stroller that you can open and close with ease using only one hand especially if you often travel out alone. As seen in the video above, operating the Fedora L3 is a complete breeze, like flicking a shirt straight! So props to that! I must mention though it takes a bit of getting used to and figuring out but once you get the hang of it, it's really simple to operate! Most if not all strollers should come with a locking mechanism for the wheels. What especially impressed me with the Fedora L3 is that the back wheels use a one-touch double brake technology! So basically, I just have to step on the green lever to unlock the wheels and the red one to lock! Super fast and convenient! I don't have to scramble to unlock both wheels before the MRT door closes anymore! I hate having to carry my bag on my shoulders all day and we all know how heavy diaper bags can get so I also always look out for a stroller that has a basket below the seat to place my bag. It's important to note that hanging your heavy bags on the stroller's handle is particularly dangerous as it can cause the stroller to topple backwards! Apart from that, I also prefer having a stroller with a separate holder at the top to put my more commonly used items like my handphone or wallet for easy access. My previous stroller had a holder to place my things but it was exposed and I always happen to leave my things on top of the stroller unattended while I attend to my baby at the front - involuntarily making myself a prey to theft. The Fedora L3 however, comes with a little pouch at the back that can easily hide and stow my stuff away! So far, I've no complaints over my brand new Fedora L3 stroller and I'm more than happy to ditch my previous bulky one away for this! I'd totally recommend the Fedora L3 to anyone who's in search of the right stroller! It's not only incredibly functional, but it's also aesthetically pleasing with it's very sleek and modern design! The Fedora L3 also comes in 2 other colours - red and blue and is remarkably easy to fix up! Even though the manual that came along with it was all in Korean, the husband still managed to fix it up in less than 15 minutes! find out more about the stroller on http://www.mymiraclebaby.com.sg/fedora-l3-stroller/!